One of our favorite summer dishes is Texas Pete Salad. Dave actually came up with this recipe, a twist on a pizza his mom makes (one of my all time favorite pizzas!) I thought I had posted the recipe for the pizza as well, but I am not seeing it, I will share that as well soon! It's so good! 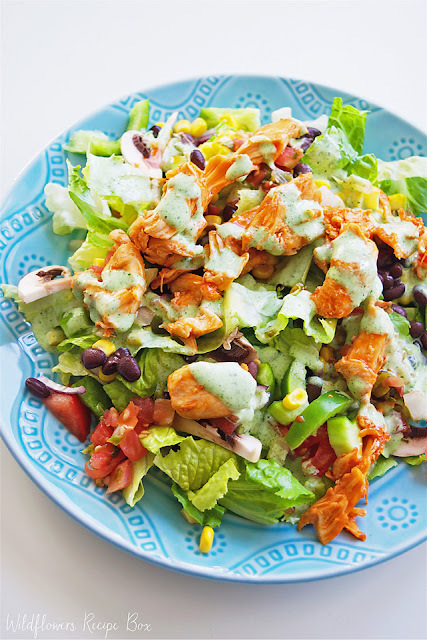 This salad is super easy and super versatile. You can add tons of veggies, whatever you like really. For the chicken, I just sautee chopped chicken over medium high heat, and once it's almost fully cooked, coat it all in Texas Pete Buffalo sauce. Make sure to buy the buffalo wing sauce, not the hot sauce, so it's not too hot! I like to let my chicken cool before topping it on the salad, so this is when I start prepping all my veggies. 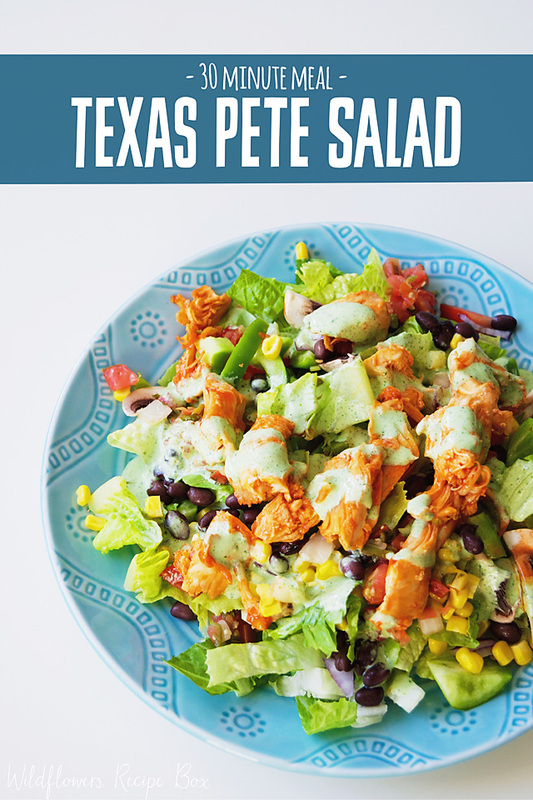 Once I have everything chopped up the chicken is cool enough, add everything together for your salad, and top it with a little more Texas Pete Buffalo and we also toss it with a homemade creamy cilantro dressing. Add everything to a blender and chill until ready to serve! So easy! I love having a bottle of this dressing in the fridge. It only lasts about a week, but I will put it on anything and everything! That's it! It's one of my favorite meals that is ready in under 30 minutes and is so flavorful!